At almost every baby shower, church function or birthday party, you could count on my mom to make one fun dish — pigs in a blanket! As long as this recipe has been around, you would be surprised at the number of people who hardly ever get to chow down on these yummies! 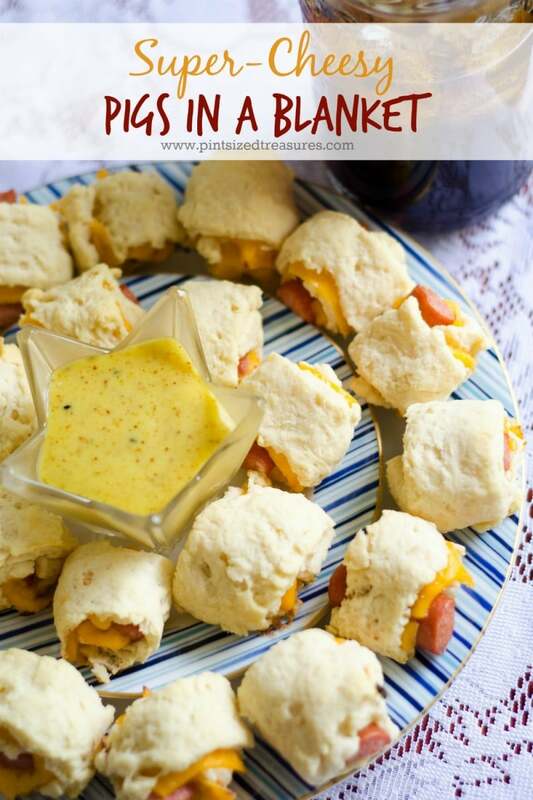 These are perfect for a holiday party, picnic, football snack or any large gathering. Trust me, it’s a lot cheaper and easier than serving hot-dogs with all the fixins’ to a large crowd. There are lots of versions of this fun recipe. My mom always used those super-cheap canned biscuits — really, the cheapest on the shelf at the store — yep those are the ones. I remember watching her roll out those biscuits and fill cookie sheet after cookie sheet with yummy piggies. I was always so proud that my mom was the one who brought the finger food that everyone raved about. Rarely were there left-overs for us to bring home! 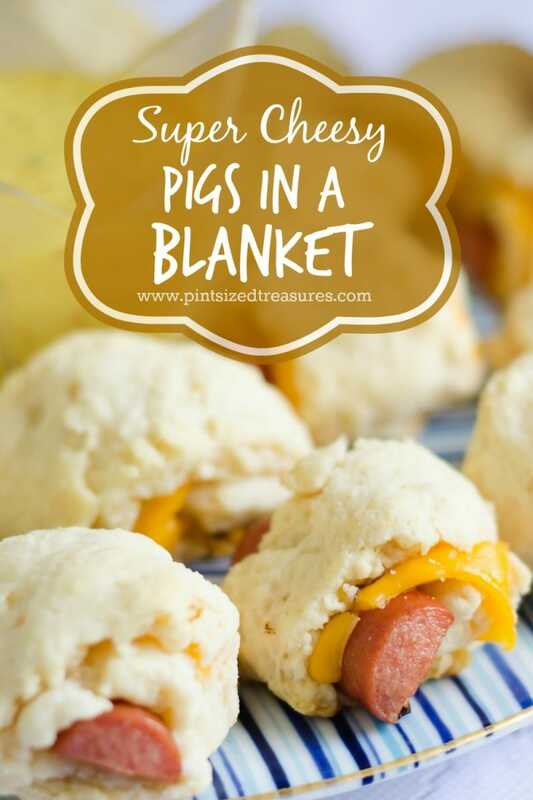 Every time I make pigs in a blanket, I think of my mom, so this recipe is super-special to me! We live oceans away from each other, but I think about her often. Do you have any recipes that always remind you of family? I hope one day my kiddos will think of me when they cook! Now, like I mentioned before, my mom always used canned biscuits, but I make mine from scratch. You can get my biscuit recipe here. Either way, they still turn out super-yummy, canned or from scratch! My mom was smart to use a frugal, time-saver like canned biscuits! I just can’t get them where I live, so from scratch it is! Don’t worry, the dipping sauce can be whipped up in minutes and is super-easy. Want to serve it to your kids and they can’t stand spice? Simply leave out the chili powder — no problem! Side note: my kids say they don’t like spicey stuff, but they loved this sauce — with the chili pepper! 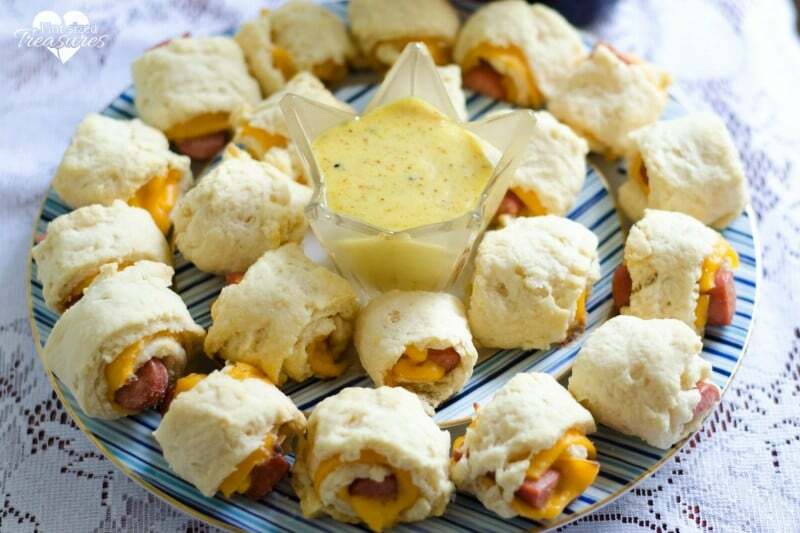 If you’re looking for the perfect party food or appetizer, you won’t go wrong with pigs in the blanket. Who doesn’t like hot-dogs, biscuits or cheese? Enjoy! For pigs in the blanket: Roll out each biscuit on a floured surface until it is flat and oval-shaped. Cut biscuit into three vertical pieces. Cut cheese slices to fit the biscuit pieces. Place cut cheese slices on flattened biscuits. Place a small hot-dog on one end of the biscuit and roll up and place on an ungreased cookie sheet. Repeat for each pig in a blanket. Bake until biscuits are puffed up, lightly brown and cheese oozes out -- approximately 15 minutes. Remove from oven and let slightly cool before serving.